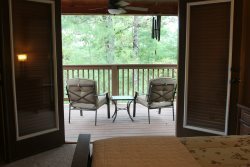 Treetops Retreat: A Rustic Retreat in North Georgia that has a hot tub, is pet friendly and has all the amenities you need for a fantastic vacation! Treetops Retreat is the crossroads between country rustic living and style, decor and function. In short, you get to enjoy all the healing and restorative power of Mother Nature while not giving up one bit of comfort or the amenities of today's modern living such as the internet, smart tvs (Bose speakers) and a Sonos system for your own music. Let's take a tour through the cabin which is situated on 3 very private acres in the Coosawattee River Resort, located just outside of Ellijay, Georgia. Getting to the house is easy and almost all of the roads are paved except for the very last stretch of road, about 1/8 of a mile, which is gravel. Once there, you will see why they call it Treetops. The cabin sits among a glade of towering trees and the deck stretches across the entire back of the cabin so you feel like you're in a treehouse. It is huge (with a state of the art grill sitting right in the middle)! As you walk through the door, you will be greeted by a style and a warm decor which we term "rustic chic." The living room with its huge propane burning fireplace is located just below the big screen, smart tv and there are two wonderful couches - one on either side of the coffee table. Adjacent to the comfy couches is the kitchen, and what a kitchen it is. Big slabs of granite on the island and along the wall facing countertops allow for plenty of prepping, and you will have all of the pots, pans, spatulas, knives and culinary tools necessary to make those incredibly delicious mountain morning breakfasts, lunches and dinners. From coffee makers to blenders, the kitchen is well appointed. On either side of the living area are the two twin master bedrooms. They are exact mirror images but each has its own decorative theme. The mattresses are heavenly and the linens are excellent ensuring the good nights rest you've been looking for. The rooms are big and include a smart tv in each. Additionally there is an ambient fireplace in each room with a heat blower so you can have the ambiance you need to stay relaxed in every room of the cabin. Truly, this cabin was made for decompressing. The Coosawattee River Resort has something for everyone. From fishing and hiking to swimming and playing in (and on) the river, this resort was made for creating memorable moments. As a guest staying at TreeTops Retreat, you will receive a Guest Pass for all the members of your party and these will get you into all of the amenities, so don’t wait another minute. With so many things to do in the resort, you might now find time to do anything else! Some additional features are the screened in portion of the huge deck. The washer/dryer should you need it, and of course, Treetops is pet friendly. Note: we mention that the cabin can sleep six because there is a queen size air mattress with linens in the closet which can be set up in the living room; however, the two kings beds are the only beds. Note: there are two sections to this driveway. The lower section is not steep and is easy to park on while the upper section is poured, granulated concrete. It is very rough/steep and made to ensure there is plenty of grip on the tires during inclement weather. It is not suitable for all vehicles, and some cars should ONLY use the lower portion of the driveway.